The graphic designer Trevor Finnegan spent seven years documenting traditional shopfronts throughout Ireland. As out-of-town shopping developments become more common, what emerged is a portrait of local resilience. A selection of his photographs has been assembled and edited by the Irish-born writer and journalist Richard Conway for the Guardian project ‘Cities’ and ‘City Exposures’ which is supported by the Rockefeller Foundation. This selection of photographs went online early yesterday [8 February 2018] under the title ‘Last orders: Ireland’s vanishing quirky shopfronts – in pictures.’ The previous afternoon, coincidentally, I had blogged in a similar fashion about a shopfront in Askeaton, Co Limerick, that has many of the charms found in the shopfronts in this collection of photographs. The feature includes shopfronts in Gowran and Tullaghought, Co Kilkenny, Emly, Co Tipperary, Naas, Co Kildare, Ballydehob, and Skibbereen, Co Cork, Lismore and Cappoquin, Co Waterford, Kinnitty and Banagher, Co Offaly, Virginia, Co Cavan, and Dublin. It is interesting that only one of the photographs – Frank’s Fancy Goods on North Frederick Street, Dublin – is from a city, and the rest were taken in small provincial towns. 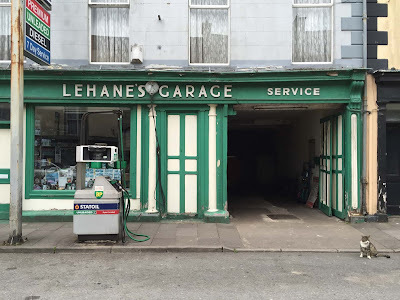 Both Greehy’s Bar in Lismore and Lehane’s Garage in Cappoquin look just as I remember them from my childhood days, when I was on my grandmother’s farm near Cappoquin. When he was researching this project, Richard Conway read one of my blog postings on a return visit to Cappoquin, and he asked me for my childhood memories. ‘This garage was a pit-stop when I was on my grandmother’s farm in the 50s and 60s,’ says Patrick Comerford, a Canon Precentor who grew up near Lehane’s of Cappoquin. The still-operational family garage opened in 1949. ‘It looks the same half a century later,’ he says.